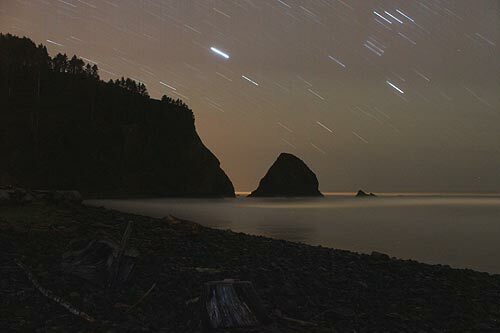 (Oregon Coast) – Ever wondered if the Milky Way Galaxy looked different in other places around the Earth? Indeed it does on the Oregon coast. But you have to use a camera to notice. This is one trip to space you can take with the beach as a launching pad - a journey of colorful discovery full of startling surprises that only show up on your memory drive. (Pictured above: Manzanita). The science behind these sights is fascinating as well. Just south of Cannon Beach, on the north Oregon coast, sits Silver Point and its nubby seastacks. Multiple layers of clouds and breaks in them make for distinctive shades, also allowing the stars to be seen racing through the sky. A fishing boat in the distance looks like a star on the horizon, while high up above there are shades of green which could well be the Northern Lights. However, it's more likely those are simply a trick of the atmosphere. 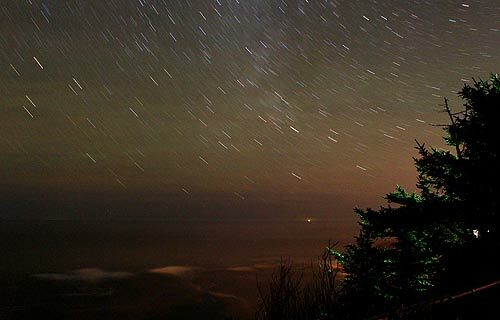 The Aurora Borealis is almost never seen by the naked eye on the Oregon coast – but the camera can see it at times with long exposures. A bit further south of there is Arch Cape, which has no lights that hit the water or the skies. You'll notice not only a variety of subtle shades of colors in the air, but even the stars have different colors. Is this that Doppler effect that astronomers use to judge if a star is coming or going? According to Jim Todd of OMSI in Portland, numerous gasses in the atmosphere cause the stars to become different colors. But these can’t be seen by the human eye – only a photographic mechanical one like a camera. 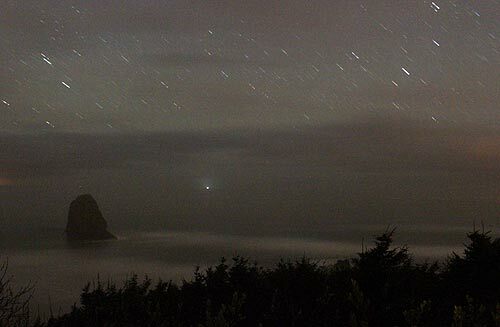 This phenomenon shows itself even more on this particular summer night at Cape Foulweather, on the central coast, between Newport and Depoe Bay. Again, those cloud and mist layers create different splashes of colors, like a veil put in front of our galaxy. Most of those shades come from light sources from Depoe Bay to the north and Newport to the south. Again, this can't be seen by the human eye. To you, the world simply appears black and a few different degrees of gray when looking at this scene in person. 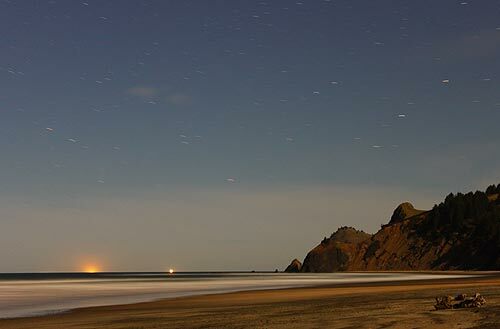 Make a long exposure like this one yourself and you'll be plenty surprised by what your rig sees that you don't. Yet another way this galaxy gets colorized like a classic movie from the Turner company is the moon, such as here at Lincoln City. Under bright moonlight, the stars struggle to be seen by you and the camera. But to the eye behind the lens, it looks like an off-kilter sunlight, dominated by blue. There's also an otherworldly look to it, like daylight in another, alternate universe. 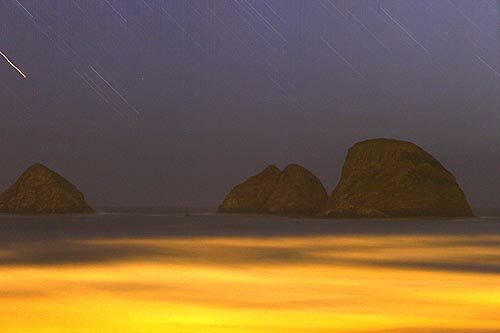 In Oceanside, those Three Arch Rocks look especially surreal on this slightly misty night. 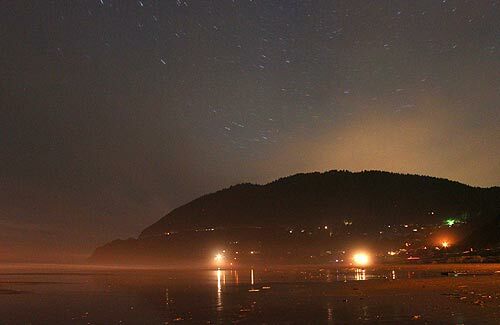 That fog makes things darker in the sky, but somehow the faint lights of the tiny town manage to bathe the waves in an esoteric glow. It takes the camera a long, long exposure to get such star streaks, which happened rather easily on this eve as to get much of anything substantial took about 15 minutes for just one photograph.